It has been quite a while since I have written on my blog, but I am back and ready to create and be inspired by the creative genius out there. 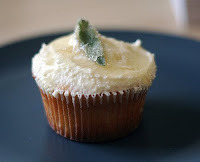 As I was looking on Tastespotting, my go to for the perfect recipe and great pictures, I came across a recipe that I liked for peach cupcakes with a sage infused frosting. It reminded me of back in the day when I used to work at in Italian restaurant. We sold this amazing ravioli stuffed with a butternut squash and served with a sage browned butter sauce. Ravioli du Zucca was the dish of choice for almost every table. It was garnished with Amaretti cookie crumbled before it was served, and never was it a miss! Everyone loved it. The sage in this recipe got me thinking about the sage in that recipe. And I decided why not combine the flavors. A butternut squash cupcake, made with browned butter and topped with a sage frosting sprinkled with Amaretti cookies. Genius, non? Quarter and seed the squash. Place in a dish with 1/4 cup of water and bake for 40 minutes at 350 degrees. Let cool, scoop out (no skins!) then puree in a food processor or blender. In a medium bowl, whisk together flour, baking soda, baking powder, salt, cinnamon, ginger, allspice, and nutmeg. Set aside. In a large bowl, whisk together sugars, eggs, and butter. Add dry ingredients and whisk until smooth. Whisk in butternut puree. Divide batter evenly among liners, filling each about halfway. Bake at 350 until tops spring back when touched, and a toothpick inserted in the center comes out clean, about 18-22 minutes. Rotate pans once if needed. Transfer to a wire rack to let cool. Bring cheese and butter to room temperature. Heat sugar and water in a small pan under medium heat, stirring until sugar is dissolved. Chop up the sage and add to the sugar and let boil over medium-low heat for 3 to 5 minutes or until the mixture is syrupy. Set aside to cool. Sift powdered sugar into a bowl or onto parchment. Beat butter and cheese at medium speed until creamy. Add half of the sugar and the sage syrup. Beat until combined. Gradually add remaining sugar. Spread onto cupcakes. Final Touches: Sprinkles with Amaretti cookie crumbles!